Alcoa (NYSE:AA) beat on earnings and revenue expectations, but tariff concerns forced the company to cut guidance. Down more than 13% on the day and Alcoa is looking rough. Its stock is not that oversold (blue circle) and momentum just swung out of the bulls’ favor (red circle). Shares also blew through $44 support. Further, longer-term support still rests almost 5% lower down near $40. I think Alcoa could easily get there, the only question is whether it will hold. Luckily, we told InvestorPlace readers earlier this month to be leery of AA as it approached resistance near $50. What a great breakout in the bank stocks. We highlighted a similar setup in JPMorgan Chase (NYSE:JPM) the other day and now its Bank of America’s (NYSE:BAC) turn. 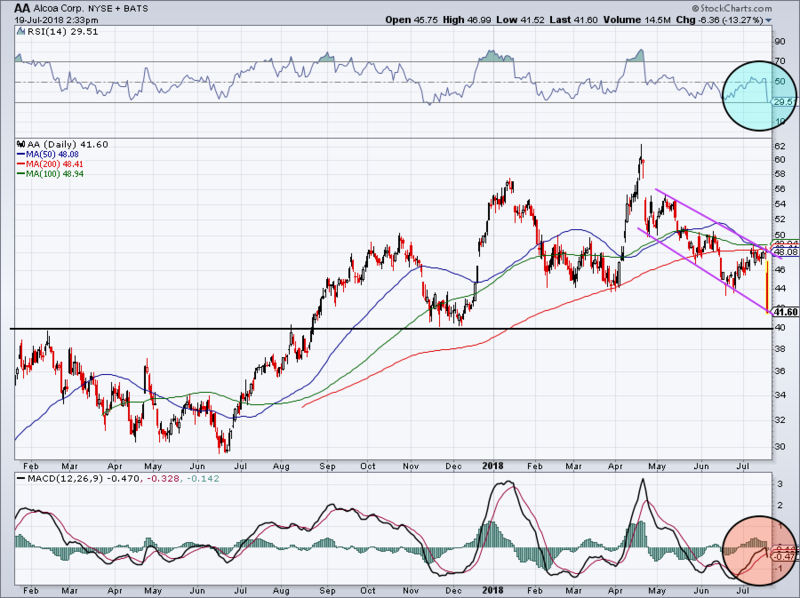 Downtrend resistance has held BAC in check since its March highs, but finally punched through a few a days ago. Shares are not overbought (blue circle) and momentum is still in bulls’ favor (red circle). 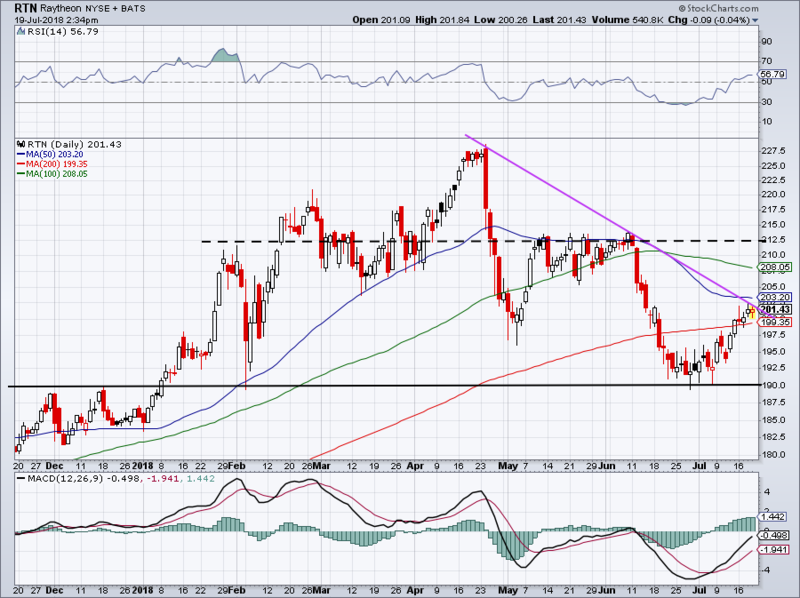 I want to buy BAC on a retest of this $29.50-ish level. Not only is it the backside of its prior downtrend line, but the 50-day and 200-day moving averages are within about 10 cents of that mark. Not to mention $29 support is nearby too. That gives buyers a great risk/reward, as a break below would signal that it’s time to exit with minimal losses. 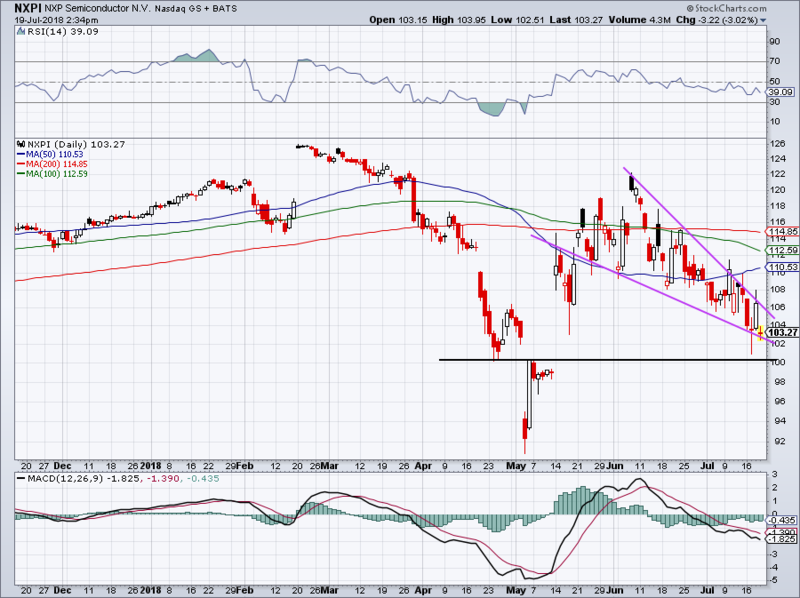 A bounce can send BAC into the low- to mid-$30s. “The Netflix (NASDAQ:NFLX) of China” hasn’t been doing so well since Netflix reported disappointing earnings. I’m surprised how well NFLX has held up despite the disappointing results and guidance, and how poorly iQiyi (NASDAQ:IQ) has done this week. Nevertheless, it’s underperforming and all we can do is ride the wave, not fight it. When shares were ripping higher in June, we suggested waiting for a pullback down toward $28.50, where Fibonacci support and a recent consolidation area would likely buoy the stock price. Shares hit that mark and ricocheted higher, hitting $38 just a fews ago. But what now? Things are getting a bit dicey and IQ reporting earnings on July 26th doesn’t help matters. Remember this is a highly volatile name, so conservative traders may want to look elsewhere. 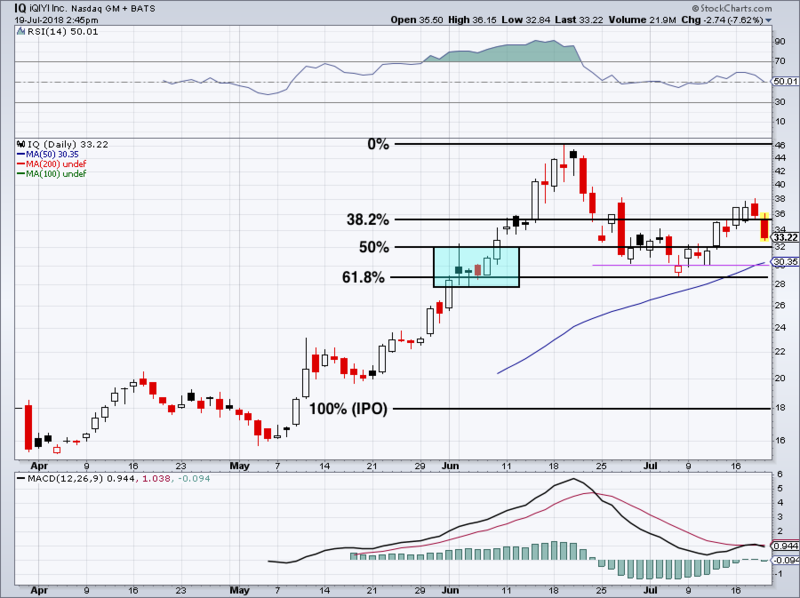 For those still interested though, see how IQ does at the 50% retracement mark, near $32. If that level fails to hold, $30 has been a great line in the sand for IQ (purple line) and it will give us the much-craved 50-day moving average test. This is a really interesting call, as NXP Semiconductors (NASDAQ:NXPI) is setting up for a 50-50 play. The situation is simple: Either China gives the green light for Qualcomm (NASDAQ:QCOM) to buy NXP for $127.50 per share, QCOM walks away from the deal after the July 25th eadline and pays NXPI a $2 billion breakup fee or the deal deadline gets extended. On its own NXPI, is a rather attractive property, so this setup works best for investors who are still comfortable owning the stock even it falls 10%. In that sense, it’s a bit like writing a cash-secured put; you’d better be comfortable owning the underlying security if it gets exercised. Qualcomm buys NXPI; shares rally ~25% to $127.50. Qualcomm bails on NXPI deal, pays latter $2 billion. NXPI stock potentially falls about 10%, down to $92. This was the previous closing price when the deal looked unlikely to succeed. The deal gets extended, in which case there’s no way to easily predict NXPI’s share price. (This one is unlikely based on recent comments from QCOM). But in any regard, we have a reasonable risk/reward on the table. NXP is a great company on its own I wouldn’t mind owning it with a cost basis in the $90s. So interested investors can take a partial position now and add to it if NXP falls into the low $90s. Should the deal go through and no pullback materializes first, we net a 25% return on our partial position. We like to keep it simple — KISS — and Raytheon (NYSE:RTN) certainly fits the bill. Support near $190 remains strong and RTN over $200 and its 200-day moving average is starting to look attractive. 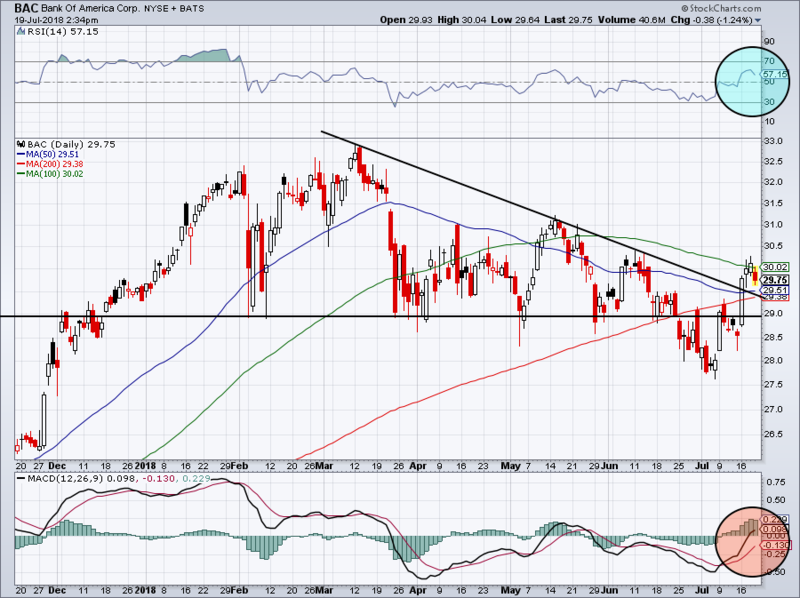 However, over downtrend resistance would make the defense name look much, much better. If it can do so, $212.50 shouldn’t be out of the question. See how RTN handles this area in the next few days and if it can get through resistance. Article printed from InvestorPlace Media, https://investorplace.com/2018/07/top-stock-trades-for-friday-nflx-jpm-bac/.